Tourmate Multilock Hoist is a new rigging cabling system specifically developed for the distribution of power and control to motorised hoists. 19 pin connectors are widely used in different entertainment applications including lighting/power distribution, audio signals as well as motorised hoist power and control. If not correctly managed this can result in cross connection. Tourmate® Multilock Hoist™ is a new rigging cabling system specifically developed for the distribution of power and control to motorised hoists. Unique pin sizes and configuration in a proven connector housing make cross connection with standard 19 pin connectors impossible. 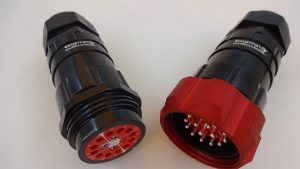 Red coloured connector faces and locking rings make components easily identifiable even in use. External branding shows the intended use. Tourmate Multilock Hoist is a complete system specifically designed for hoists. Developed to work as a Spider and a Multicore system. Easily integrated into most current rigging control systems with no modification to metalwork.